Take care of a runaway crew member. Speak to Kjar onboard his ship at the Windhelm docks. Travel to the random location and kill the bandit leader. Return to Kjar for your reward. Kjar, ship master of The North Wind currently anchored at the docks in Windhelm, will ask you to hunt down and kill a runaway crew member. The sailor had formed a group of bandits, who are currently hiding out in one of five random locations. Travel to the location and kill the bandit leader there. Return to Kjar, who will give you a year's salary (a leveled gold reward). The quest Kill the Bandit Leader can have identical quest objectives. It is possible to trigger the quest by killing the required leader without first speaking with Kjar. It adds an objective to return to Kjar. Once spoken to Kjar, you will receive the objective to kill the leader. Telling Kjar of the leader's death will complete both objectives. If you are sent to Uttering Hills Cave, and have already completed Summerset Shadows for the Thieves Guild, you will be unable to complete this quest, as the bandit leader is replaced by Linwe and the former is nowhere to be seen. You can still progress through the quest by typing "c5688".kill in the console. You can progress through the quest by typing "SetStage FreeFormShipsWindhelm 15 in the console. If you have completed the mission and levels later reenter the same location once it is repopulated, it can give you the completion again, allowing you to collect a bounty for re-killing the rogue crewman. The bandit boss is prematurely made available to kill before Kjar actually offers the quest. 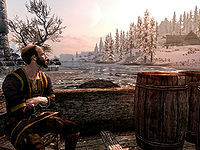 On the PC, it is possible to use the console to advance through the quest by entering setstage FreeformShipsWindhelm stage, where stage is the number of the stage you wish to complete. It is not possible to un-complete (i.e. go back) quest stages, but it is possible to clear all stages of the quest using resetquest FreeformShipsWindhelm. This page was last modified on 16 June 2017, at 10:12.